In this lesson, we will learn how to use lengths and areas to find geometric probability. 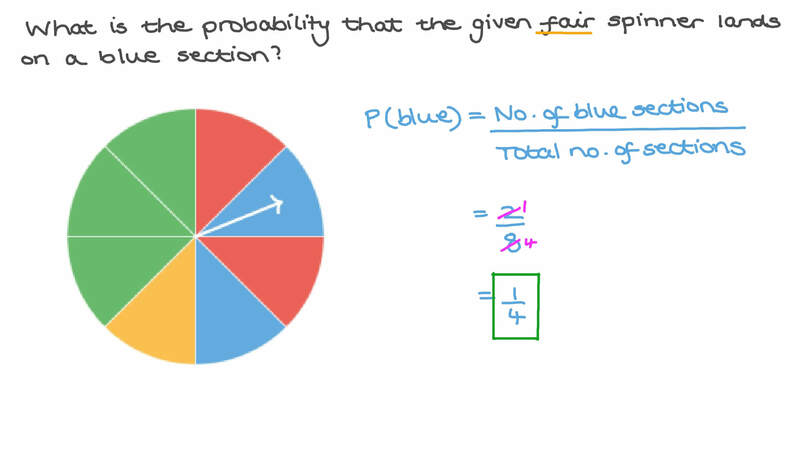 What is the probability that the given fair spinner lands on a blue section? Suppose three of the labelled points are chosen at random. 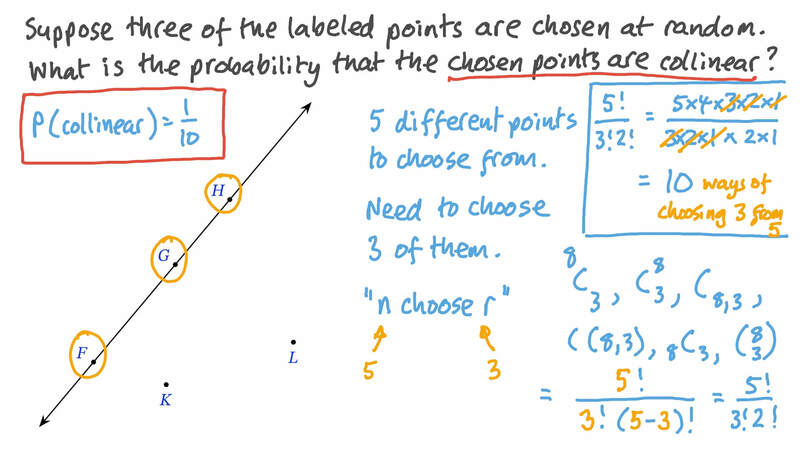 What is the probability that the chosen points are collinear? A real number 𝑋 is randomly chosen between 10 and 100. Find the probability that 𝑋 is closer to 50 than to 100. A target board consists of three concentric circles of radii 6 cm, 12 cm, and 24 cm, which define three regions gold, red, and blue as shown in the diagram. If a dart is thrown randomly such that it hits the target, what is the probability that it will hit the red region? At an animal park, the keeper feeds the lion at a random time between 2 and 3 pm for about 5 minutes. A family decides to go to the lion area at a random time between 2 and 3 pm and, in case the lion keeper has not started yet to feed the lions, to wait for 15 minutes for the keeper to arrive before leaving. What is the probability that the family sees the lions being fed? Nada is randomly tossing shoes onto her rug which is modelled in the diagram. What is the probability that the shoes will land in the shaded area of the rug? Give your answer as a fraction in its simplest form. The following dartboard is made of one large circle with a circumference of 1 8 𝜋 inches and a smaller inner circle with a circumference of 4 𝜋 inches, each divided into eight equal sectors. What is the arc length of the sector created by sections 𝐴 and 𝐶 ? What is the probability of hitting the section of the dartboard labeled 𝐴 ,to the nearest hundredth? What is the probability of hitting the section of the dartboard labeled 𝐴 twice in a row, to the nearest thousandth? What is the probability that the given fair spinner lands on a yellow section?